Lisa also kindly sent me a book with not only the actual poem but also the illustrations by Sheilah Beckett on which she based her piece. Check for more photos and details the post on Feeling Stitchy I wrote about it and Lisa has many more gorgeous detailed photos of her embroidery on Flickr. Because of the girls' summer vacation there is not a lot of time (or energy) for exciting new craft projects. Luna and I did make some progress on the little dolls quilt we are making together for her toy horse. She did a wonderful job with stitch-in-the-ditch-quilting! And I made a tiny bit of progress on the Organic Embroidery. Colonial Knots were added all around the outside of the yellow bit. I made a feeble attempt at trying to learn the Colonial Knot early in my embroidery 'career' but soon gave up. With the Embroidery Companion (the Yvette Stanton book for left-handers that I always keep near) in my lap I tried again and still found it very tricky to master this stitch. I felt like two hands weren't enough to make one miserable Colonial Knot! Next I added a circular Fly Stitch. I needed a little guidance to make it more or less round, hence the blue marks on the fabric. I actually quite like the Fly Stitch but don't use it very often. 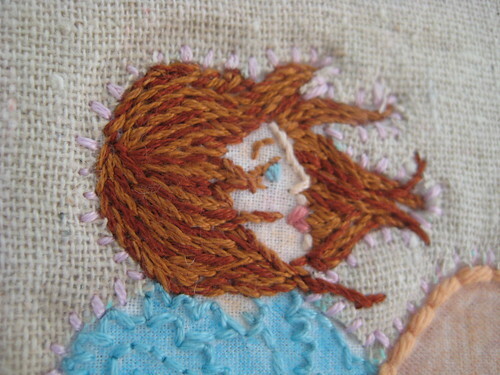 While I was organising some stuff in my house I came across a lot of forgotten embroideries in progress. I'm so easily tempted to start a new project but really should finish at least some of these. One is pretty special, I started it over 2 years ago and I bet some of you will be surprised I have not finished it! Oh, my goodness! The hair! It's SO lovely. I love the wall and the new embroidery! Just beautiful! I think we talked about this before, but I have one of Gigglymama's Tom Waits portraits and I just love it. Your collection is inspiring me.